When a chartplotter is connected with an AIS receiver so the chartplotter receives data from the receiver about an AIS target, the chartplotter typically draws the target as an overlay of the electronic navigation chart display. The AIS transmission from a vessel will include various data, generally in two forms: static data about the ship, and dynamic data about its navigation. It is important to note that when a vessel transmits its position, it is really sending the position of the antenna of its GNSS receiver or other sensor. For large vessels that might be 1,000-feet long and 150-feet wide, the location of the position sensor is significant to know. If the vessel has its navigation house at the stern, the GNSS antenna will typically be there, too. The position reported is thus associated with the location of the GNSS antenna; the bow of a large vessel with its GNSS antenna at the stern could be 900-feet away from the reported position. --the target vessel is drawn as a ship outline in proportion of its reported length and breadth, relative to the reported position of the GNSS sensor on the ship. 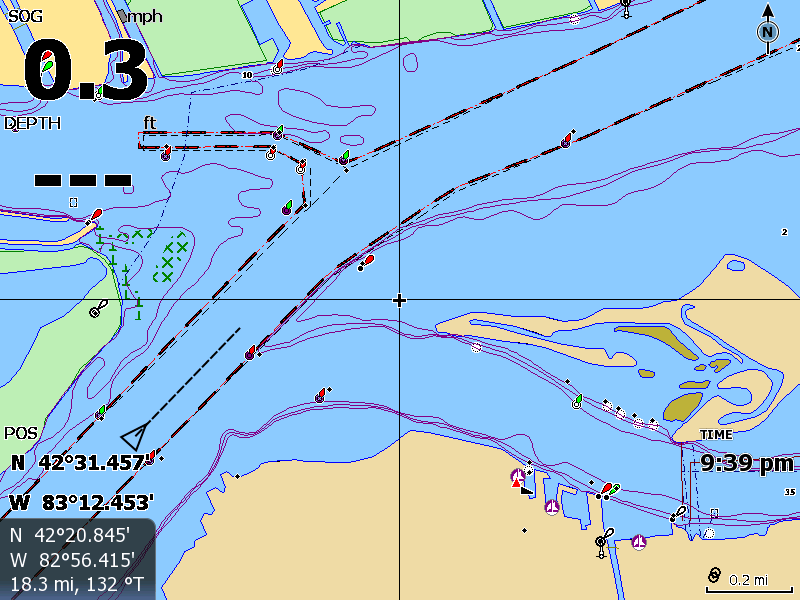 The AIS target is drawn on this chartplotter as a generic icon without any ship dimensions being represented; this screen capture is from an Lowrance HDS chart plotter. 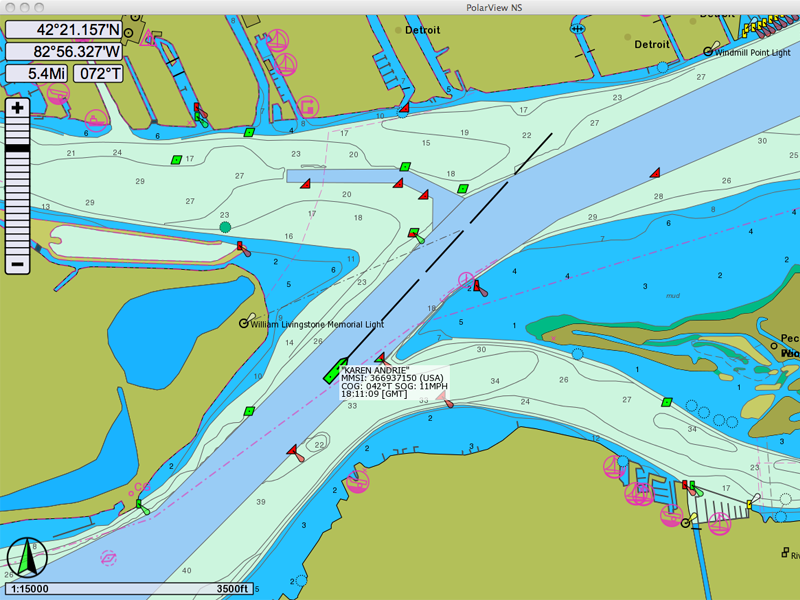 The same AIS data as a above, but drawn on an electronic chartplotter than can show the ship representation on the chart with its proportional dimensions; this screen capture is from PolarView NS, a chartplotter program that runs on a computer, rather than on dedicated marine electronic hardware. In the above comparison, the same data was available to both chart plotters; the data was played out from a file of recorded AIS messages to each chartplotter. The difference in representation is due to differences in the chartplotter capabilities to display AIS targets. It is important to remember that static data about the ship sent in AIS Message 5 is only transmitted at six minute intervals, and a chartplotter cannot draw the ship as a proportionally represented icon until it has received this data. A Class-B AIS vessel should also be transmitting vessel static data, so a screen showing vessel dimensions for a Class-B AIS vessel should also be possible to capture.